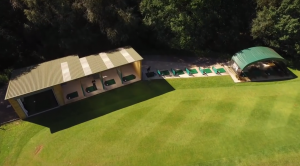 We are the only company on the market that can offer the Golf Club or Club/Teaching Professional an opportunity to build a bespoke teaching or practice facility structure for all year round golf. Indoor swing rooms and teaching studios are becoming a must have item for a golf club to develop its teaching, club fitting and membership relationships.. never mind keeping up with the Jones’s! We can provide all aspects of the Golf driving Range build process from the planning drawings for the teaching studio and advice. Site location and orientation planning as well as the total build and fit out solution of a driving range, teaching bay build or simulator. We will project manage every step of the process ensuring a smooth and quality build. We will help you with proposal letters to put it to your Club owner or committees, we will meet with your board or group to help show return on investment and help you bring it to fruition. Draw up detailed plans and designs for your bespoke build. This can help for proposals to your Club or Owner or for submitting for planning permission if necessary. Design and build of a bespoke driving range structure for teaching indoors with a shutter or a simple driving range style unit. On site project management of all aspect of the driving range construction from start to finish providing a turn key solution. Provide a secure steel electric roller shutter from market – nationwide leading brand. UPVC windows and doors in specific colours and designs. Full electrical interior fit out. Can include sockets, lights, spot lights suitable for video coaching, wall heaters and much more. We can offer you every step of the process and have it all designed and built onsite within a couple of weeks from the agreement of plans. Laying of a suitable base for your unit either in wooden sleepers or concrete base. Design and build of a bespoke unit for teaching in with a shutter or a simple driving range style unit. GolfDrivingBays.com is run by PGA Professionals so we know what you need. We will come down to your site and access location, build, design, electricity, lighting, and build plan. We have a great team who are experts in the field of Range Bay build. Freddy has competed at the highest level of professional golf and has several European Tour starts to his name. As a talented player he has amassed an impressive number of professional wins and enjoyed a successful if more brief then he would have wanted playing career. Freddy now concentrates on his golf lesson business as well as running the Golf Driving Bays business and has a fantastic reputation in the industry.